Deb's Cup of Tea: Uh oh. This is Not Good. Today's task was to find and set up the sewing machine. As usually happens with these kinds of tasks, they beget more tasks. The machine is stored in the office under a table that is rather loaded. Plus, there's been an accumulation of stuff under the table. Well, I was going to have to deal with the stuff in order to get to the machine. That took about an hour and a couple trips to the recycling bin. The machine was liberated and moved into the living room. It's nothing fancy. 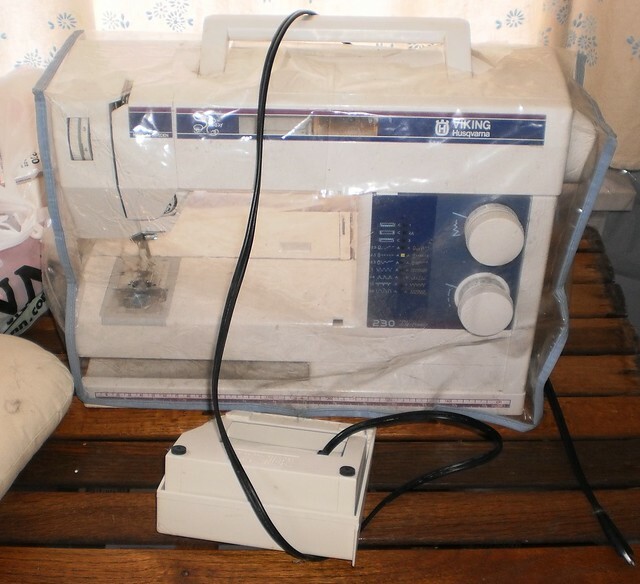 I don't do fancy for a sewing machine. Machine embroidery is way over my head. The most zig-zaggy I get is doing button holes. This has served me in good stead for many, many years. There's the foot pedal and here's the huge problem. I can't find the power cord. I have found a lot of other stuff I didn't know I was missing as well as some things I have missed, but I can't find the power cord. I looked up my machine maker online but of course my model is nowhere to be seen on their web site. I've sent an email along with this photo and asked about buying another cord. I hope I can or this great sewing project and all the sewing projects in my house have come to a huge, screeching halt. Update: I received an email back from Viking. I need to purchase a cord at an authorized dealer. Now to find an authorized dealer.